The top five global capital corporations are technology platforms—Apple, Google, Microsoft, Amazon and Facebook. Platforms are a host for a variety of services and uses. All of the big five platform corporations have become too large in a short period of time to have any significant competition outside of this group. They compete against one another, adding services to secure their monopoly by offering users everything they do online. 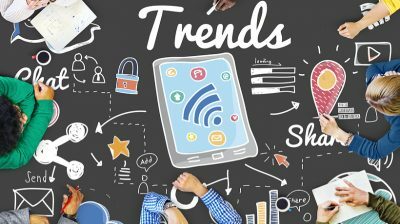 If a new service is developed that seems to be gaining users, or that competes with an element of their platform, it is purchased and integrated into the platform—avoiding new competitors. Alternatively, they use their massive resources to develop a comparable app and push the potential competitor aside. 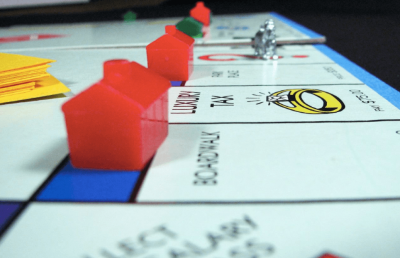 Snicek, in Platform Capitalism, points out that the development of these monopolies “introduces new tendencies within capitalism that pose significant challenges to a post-capitalist future.” Building public cooperative platforms becomes an impossible dream. No surprise—these platforms have moved to colonize education. Public education represents a big chunk of potential revenue. Just as importantly, schools are where one can find most of the future potential consumers and users of the platform services. Colonization is a process where a significant force moves into an area and dominates. It takes over not only the production and resources, but imposes—often by stealth and power—the processes and approaches and even values of the social and cultural environment. And, dominate is what the monopoly platforms are on track to do in public education. The most successful colonizer has been Google. 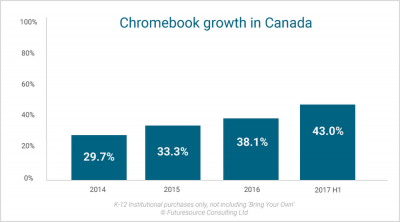 A recent report indicates that Google’s G-Suite for Education is being used by half the teachers and students in the U.S. Canada is fast approaching the same level of use. 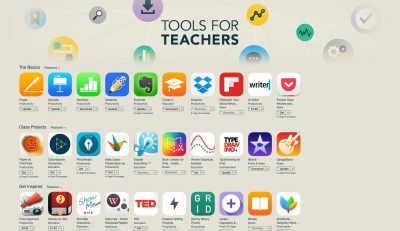 It includes a range of free software tools that can be used by students and teachers—word processing, presentations, spread sheets and the like. 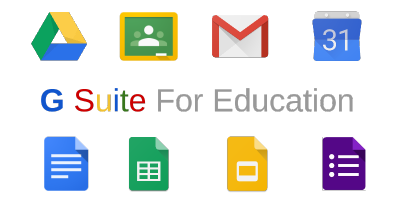 G-Suite incorporates “Classroom,” an integrated learning management system that keeps track of grades, attendance and more. And, of course, YouTube is linked to student use. Google, rather than democratic public institutions, therefore shapes what is on offer. Google’s position as colonizer is strengthened by the hardware increasingly used in schools—the Google Chromebook. It is less expensive than other computers because much of what it needs to operate is supplied by Google in the cloud—operating software, applications and memory. No need to build those into the computer. According to market reports, Chromebooks make up the majority of all computers sold to schools in the U.S. and are marketed globally. It’s not an accident that it is “Microsoft 365” that is being pushed. It offers a cloud-based software and cloud storage for your work. It is the new business model for Microsoft: they don’t sell you software, you rent it—and you keep paying for it. And your work isn’t saved on your own computer, so you have to keep up your subscription. Like Google, they are hoping that students will keep using their tools when they finish being students. Microsoft is imitating much of what Google offers, but by charging for the service rather than trading it for data. It offers apps, educator training and STEM lessons “to enrich science, technology, engineering and math classes.” They offer “budget friendly” Windows 10 devices with licences for Microsoft 365 Education. The other major tech corporations have programs as well. Apple, for example, was the first into education with the Apple IIe and the “Apple Classroom of Tomorrow” way back in the 1980s. More recently it depended on the ease of use of the iPad, despite its cost, to sell classroom sets along with Pearson curriculum in an ill-fated project with Los Angeles schools. Venture capitalists are hoping to find the magic app that will make a fortune. The potential market is indicated by expenditure of hundreds of millions each year on developing new products. The “winners” are likely to be bought up by one of the major corporations—or find their product idea taken by the monopolies. Not enough attention is paid by education authorities or researchers to the shaping and distortion of education that is possible—even likely—by this colonization of education by technology monopolies. Whenever the OECD releases the Program for International Student Assessments (PISA) results, breathless reporting usually follows. There are many reasons to be skeptical of international rankings based upon a single test given to 15 year-olds. Despite its international “superpower” status, a majority of Canadians don’t believe their public schools measure up to private schools. Less than seven percent of Canadian students attend private schools, but the majority of Canadians believe private schools provide a better education than public schools. In a 2012 Ipsos-Reid poll, 58% of respondents stated they believe private school education is better than public school education; 63% said they would send their children to private schools if they could afford it. 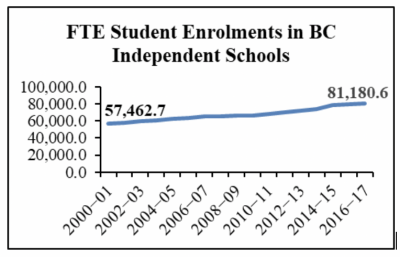 In British Columbia, there has been a 12% drop in public school enrolment since 2000. Meanwhile private school enrolments have increased from nine percent in 2000 to 13% in 2017, almost double the national average (Source: FISABC). So, if more parents in Canada and BC are choosing to send their children to private school is this an indication that private schools are really better than public schools? Not necessarily – indeed the research evidence suggests the answer is “no.” I will come back to this point in moment, but first let’s explore the conventional wisdom that private schools are better than public schools. 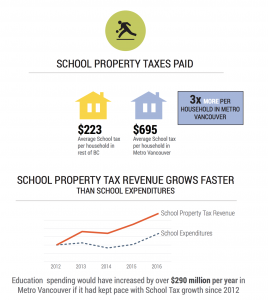 In BC, key factors that coincide with private school enrolment increases is an historic era of labour conflict, budget cuts, school closures and overcrowding in the public school system from 2000-2016. Another factor related to increased private school enrolment is marketing. 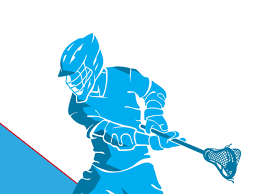 Extensive marketing campaigns touting a private school advantage cannot be underestimated. 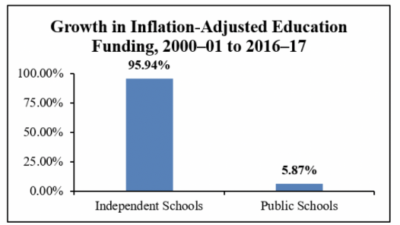 In addition, while BC public schools were under a funding siege for the first 16 years of this century, private schools were enjoying significant funding increases and a wealth of positive (and free) press from publication of school ranking schemes, which consistently placed private schools at the top. All of these factors feed the idea there is a private school advantage. But, reality is more than appearances and focusing exclusively on appearances—on the evidence that strikes us immediately and directly—can be misleading. This is particularly true when we examine school rankings because private schools’ higher average test scores are at the heart of the conventional belief that private schools are better than public schools, along with their typically well-funded programs. Anyone who scrolls through the rankings of BC schools will find evidence that students who attend private schools have better on average academic performance than public school students. But the key question is to what degree do private schools actually produce those results? In 2011, OECD’s analysis of PISA results found that while students in private schools tended to outperform their public school peers, the difference was primarily the result of the higher socio-economic status of private school families. In their 2013 book, The Public School Advantage, University of Illinois researchers Sarah Theule Lubienski and Christopher Lubienski found that compared to private schools students, public school students performed the same if not better on achievement tests once demographic factors were taken into account. In addition, Pianta and Ansari found no evidence to suggest that low-income children or children enrolled in urban schools, benefited from private school enrolment. Are private schools really better than public schools? Conventional wisdom may say they are, but the evidence suggests that is a myth. 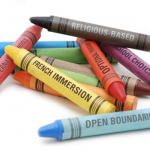 Parents send their children to private schools for a variety of reasons that make sense for them. But, there is substantial and growing evidence that there is no value-added in private school education. For more research-based resources on private schools see “Resources on Private Schools” by National Education Policy Center at the University of Colorado. I usually spend August thinking about what I’ll do when I’m back at school again in September but lately all I can think about is 48 C rain. I keep wondering about what lessons would prepare my teen students for a world where hot water falls from the sky, where oceans are too warm to cool nuclear reactors, and when road surfaces from India to the UK keep melting. 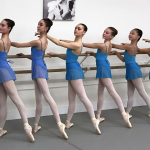 What do my 15-year-old students need to know? Certainly there’ll be discussions about the socio-cultural impacts of artificial intelligence and the economic outlook for a “world without work,” but I’m not quite sure where in our curriculum we’ll be addressing living in a world where new colours have to be added to weather maps to display unprecedented heat. Should we be teaching them how to recover after wildfires or rising seas have destroyed their homes? A century ago a few teachers may have encouraged teens to question militarism in the aftermath of The Great War but any suggestion that relentless economic growth would lead to millions of deaths and an uninhabitable planet would likely have resulted in a referral to an asylum. After all, the age of mass consumerism was just beginning and there were all those newly electrified gadgets to buy. Any day now the back-to-school ads will be popping up on screens everywhere. We’ll keep being reminded to buy, buy, buy. The tragic irony is that we have created an economy that is utterly dependent on consumer confidence and yet it’s mass consumption that is leading us to a new norm of rain that falls at 48 degrees Celsius and rivers too warm for salmon to spawn. And there’s the rub, isn’t it? When our education system is a product of, and is sustained by a consumerist society, is it hypocritical to challenge conformity to consumerism? Within the next 24 months, my Grade 10 students are going to have to make choices about future education and careers. What should they know about how their lives may be affected given that many experts are predicting that the “oil bubble is about to burst“? Does my teaching role include preparing my students for a post-consumer society? Can we actually return to a time when we were known by our “societal roles (parents …doctors, plumbers, etc.) or political status (voters),” not just by our roles as consumers or customers? Lizanne Foster is an IPE/BC Fellow and a secondary teacher in Surrey. A just released BCTF Research Report, International student tuition income increases—and inequality grows, authored by IPE/BC Fellow Larry Kuehn describes the increase in international student enrollment in BC schools, resulting in a substantial increase in resources for schools in Vancouver and the Lower Mainland. The policy has been a success in an economic sense. International education is the third highest “export” from BC, behind only forestry products and minerals. Education—K–12 and post-secondary—is considered an “export” because it brings in income from across borders for tuition and living expenses. However, given the way it is structured, the increases in tuition revenue also increase the inequalities. Eleven school districts (out of 60) received 73% of the total funds in 2016–17: 10 districts in the Metro Vancouver area and the Victoria area. International student tuition is generally $15,000 for an academic year, twice what BC provides for each Canadian student. 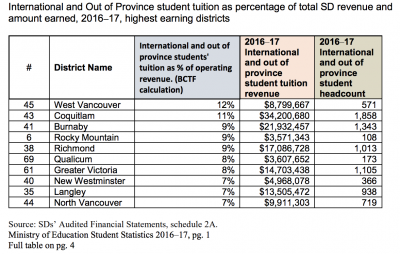 West Vancouver and Coquitlam school districts benefit the most from international student tuition revenue. 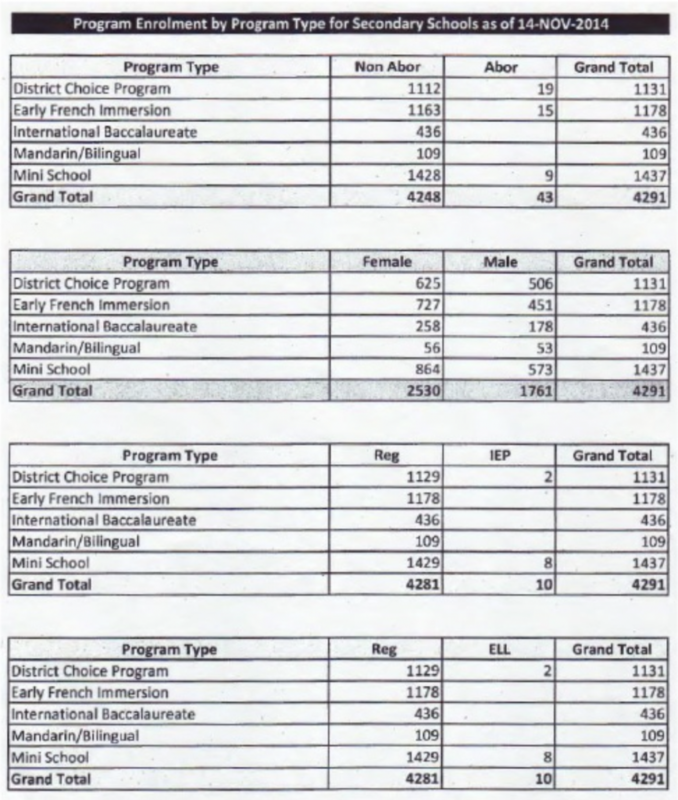 Tuition from international students was promoted by the previous administration to increase financial resources during a period of government austerity policies. The question now is how the inequality this revenue stream has created will be addressed in the future school funding formulas. Ask any parent if they want their child in a classroom with 15 students or 30 students and the answer is obvious. Ask any teacher if they would prefer to teach a class of 15-20 students or one with 35 students and again the answer is obvious. The obvious answers are not reflected in class sizes in British Columbia’s schools. With the Supreme Court of Canada decision will come restoration of class size and composition for BC schools. That means restoring class size to 2001 levels: 20 for Kindergarten, 22 for Grades 1–3, and in most districts 30 for Grades 4–12. Rolling back class size is a good thing, but even this much needed remedy will not go far enough in taking full advantage of the benefits of small class size. What we know is that smaller classes lead to positive student outcomes. And this is so because students are more engaged, spend more time on educational tasks, and gives teachers the opportunity to tailor instruction to the needs and abilities of students. 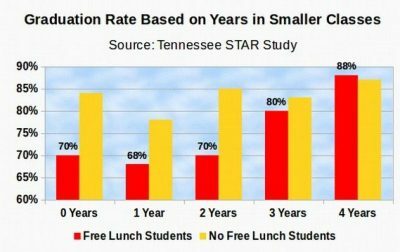 The benefits are not only apparent in academic indicators like test scores and grades, but also longer term educational and life outcomes like high school completion, less juvenile criminal behaviour, and increased post-secondary enrollment. This research suggests we should work toward small classrooms and give teachers the opportunity to provide instruction tailored to students’ needs, to give consistent and individual feedback, and to use class time for educational goals rather than on discipline. Not only do we know that small class sizes are beneficial, we also know that is especially so for early grades and for students who come to school with disadvantages, such as poverty, limited English proficiency, and minority status. Small class size benefits teachers as well by improving working conditions, increasing job satisfaction, and retention. How small is small though? The research evidence suggests that any reduction in class size will likely have some positive effect, but that optimally small classes sizes are between 15 and 20 students. (Small classes in the STAR study were between 13 and 17 students.) For BC schools to take advantage of the benefits of small class size this means much further reductions are needed, indeed class size for all students ought to be at least at the level set for BC Kindergarten classes in 2001… 20 students! This will be a struggle for BC schools already having difficulty finding enough teachers and classroom space to operate at the 2001 class size limits. The process of recovering the status quo of 16 years ago will take some time, but everything we know about quality education tells us this is not the place to stop. More resources for both infrastructure and personnel is necessary. Make no mistake that reducing class size is an expensive educational reform, but research suggests this will be money well spent. Sandra Mathison is a Professor of Education at the University of British Columbia and Executive Director of IPE/BC.